Two college students have filed a class-action lawsuit in the midst of the largest college admissions cheating scam ever prosecuted in the United States. BOSTON -- Two college students have filed a class-action lawsuit in the midst of the largest college admissions cheating scam ever prosecuted in the United States. Federal prosecutors in Boston on Tuesday charged 50 people, including celebrities like Loughlin and fellow actress Felicity Huffman, as well as CEOs and college coaches. Stanford University, the University of Southern California, UCLA, the University of San Diego, the University of Texas at Austin, Wake Forest University, Yale University and Georgetown University were named as defendants in the suit. Erica Olsen and Kalea Wood say they were denied a fair opportunity to apply to college and that the scandal allowed "unqualified students" to get into "highly selective universities." What is Operation Varsity Blues? Singer pleaded guilty in Boston to racketeering conspiracy and obstruction of justice. Parents spent anywhere from $200,000 to $6.5 million to guarantee their children's admission, officials said. Who has been arrested in connection to the case? The FBI set out to arrest 46 of the 50 defendants. The majority of the arrests took place Tuesday. Huffman was arrested in her home, and sources tell ABC News that guns were drawn during her arrest. She appeared in court in Los Angeles, and a judge allowed her to be released on $250,000 bond, with orders to not travel outside the United States. Loughlin's husband, fashion designer Mossimo Giannulli, was also among those arrested on Tuesday. On Wednesday, Loughlin was taken into custody after returning to the United States from filming in Canada. Later that day, Loughlin was released on $1 million bond. While out on bond, she was allowed to continue traveling to work on a film project in British Columbia but must surrender her passport when that work is done later this year. 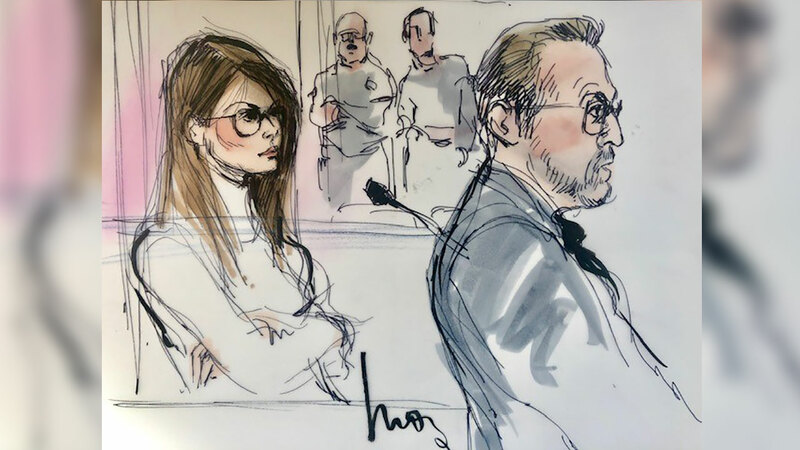 Lori Loughlin appears in a Los Angeles courtroom on Wednesday, March 13, 2019 on the college-admission bribery case. The coaches worked at such schools as Stanford, Georgetown, Wake Forest, the University of Southern California and University of California, Los Angeles. The former Yale coach pleaded guilty and helped build the case against others. All of the coaches who were charged and still actively working at their schools have either been fired or placed on administrative leave. The suspects were mostly charged with conspiracy to commit mail fraud and wire fraud. "Today's arrest should be a warning to others," Joseph Bonavolonta of the FBI said on Tuesday. "You can't pay to play. You can't cheat to get ahead, because you will get caught." What allegedly happened during Operation Varsity Blues? In some cases, authorities say Singer arranged for a student to take the SAT individually with a proctor he had bribed in Texas or California. In other cases, Singer allegedly bribed coaches to establish fake credentials designating students as recruited athletes even when those students did not play the sport in question. In one instance highlighted by federal prosecutors, it is alleged that the head women's soccer coach at Yale was paid $400,000 to accept a student even though the applicant did not play soccer. The parents of that student had allegedly paid Singer $1.2 million. Authorities said coaches in such sports as soccer, sailing, tennis, water polo and volleyball took payoffs to put students on lists of recruited athletes, regardless of their ability or experience. Once they were accepted, many of these students didn't play the sports in which they supposedly excelled. Prosecutors said parents were also instructed to claim their children had learning disabilities so that they could take the ACT or SAT by themselves and get extra time. That made it easier to pull off the tampering, prosecutors said. The applicants' athletic credentials were falsified with the help of staged photographs of them playing sports, or doctored photos in which their faces were pasted onto the bodies of genuine athletes, authorities said. The nationwide scheme was prosecuted in Boston in part because it was uncovered by FBI agents there working an unrelated case. They say fake test scores were submitted to Boston College, Boston University and Northeastern University. Prosecutors said it was not an accident that there are no students charged, though they did not rule it out. But they have been told that in most cases, the students did not know what their parents had done to get them into the college of their choice. According to court documents, Huffman and her husband -- actor William H. Macy -- "made a purported charitable contribution of $15,000...to participate in the college entrance exam cheating scheme on behalf of her eldest daughter. Huffman later made arrangements to pursue the scheme a second time, for her younger daughter, before deciding not to do so." Federal agents say they have recorded telephone calls with Huffman and a cooperating witness. Macy is not charged or named in court documents. The documents say that Loughlin and her husband "agreed to pay bribes totaling $500,000 in exchange for having their two daughters designated as recruits to the USC crew team -- despite the fact that they did not participate in crew -- thereby facilitating their admission to USC." Officials say they have emails from Loughlin. "Today's arrests resulting from an investigation conducted by the U.S. Attorney's Office in Massachusetts send a clear message that those who facilitate cheating on the SAT - regardless of their income or status - will be held accountable. The College Board has a comprehensive, robust approach to combat cheating, and we work closely with law enforcement as part of those efforts. We will always take all necessary steps to ensure a level playing field for the overwhelming majority of test takers who are honest and play by the rules." Authorities said the list of parents involved may grow as the investigation continues in the coming months.